We have found our property prince, more research is in the works with more foundation courses and of course sharing the power of 5th place with all those who come into our lives. We knew we would have to kiss quite a few frogs to find our prince. We did and we did! After our disappointment at having our first offer turned down, (if you read our 5 November 2018 post you will know we had been cautiously optimistic) we kept on going. And going and going. We kissed over 30 property frogs and found our prince (or princess more like it - she is so beautiful!) unexpectedly and serendipitously. The deal went through in less than five days. It was meant to be. We move into our new 5th Place around mid March. 2018 was a year of prototyping, experimenting, reworking, discovering and creating. We started off the year with a magical tool and not any real understanding of what to do with it. We found it difficult to language what we had and what we did, (we still may not have got it quite right). 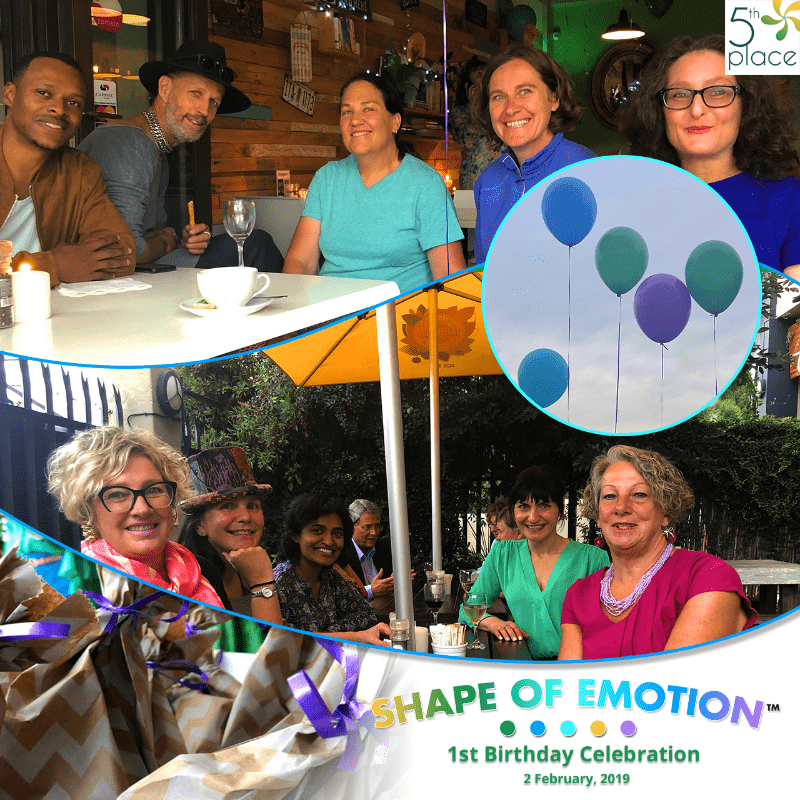 We put 30 people through our Shape of Emotion Foundation Course and exposed over 200 more to our work in various forms. Along the way we collected principles that talked to how we show up and what working with our emotions does for us. They provide a basis for all our work. We saw how our five qualities acted like the points on a compass, and guided us to places and people that were looking for the same. Our pillars acknowledged our multifacetedness, our desire for balance and harmony. Slowly we had developed more than a tool or a range of offerings, we had cultivated a way of life. And we were living it. Emerging into 2019 we had this feeling that things were going to ramp up. Well, they have to ramp up - we want to grow, we want to spread the Shape of Emotion word and lay the foundation of a 5th Place in every heart, on every corner, in every office. Leaps and bounds is our theme for this year. And then there was our first birthday celebration. 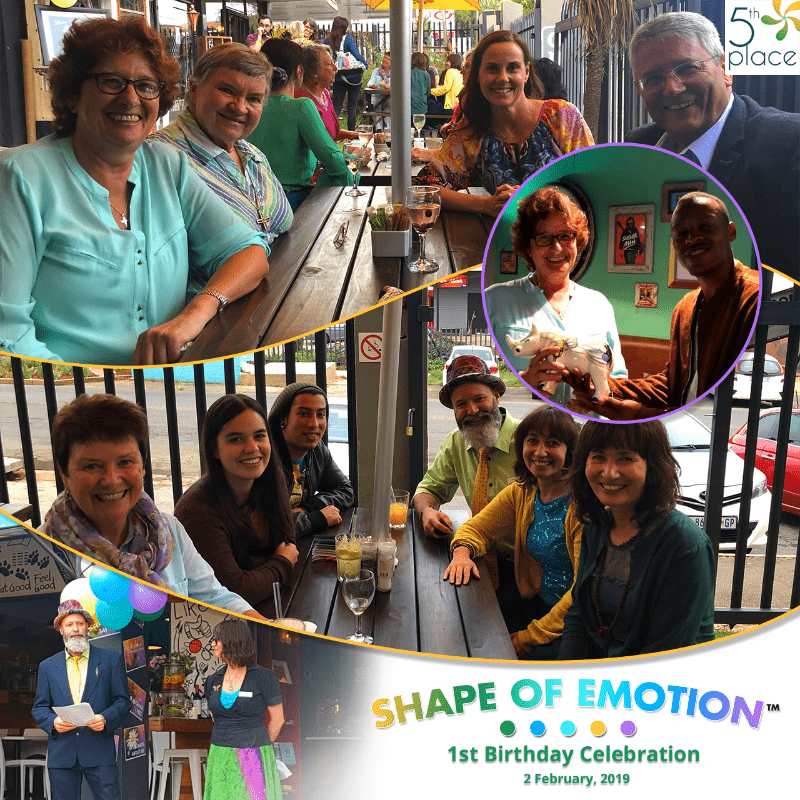 We invited people who had been instrumental in the infant year of Shape of Emotion. There were the individuals that had unwittingly seeded the work. Some were brave souls who had signed up for our Foundation courses or attended an Emotional Fitness Class even when they didn’t have a clue what we were offering. Those that piloted programmes and provided us with spaces to work in. Some received the nod simply for just being so damn enthusiastic about our work, supporting and cheer-leading us along the way. Exactly a year to the day that we announced the birth of Shape of Emotion to a group of 11 guinea pigs (thanks to all of you!) we stood in front of the most colourful bunch of people to honour and thank them. 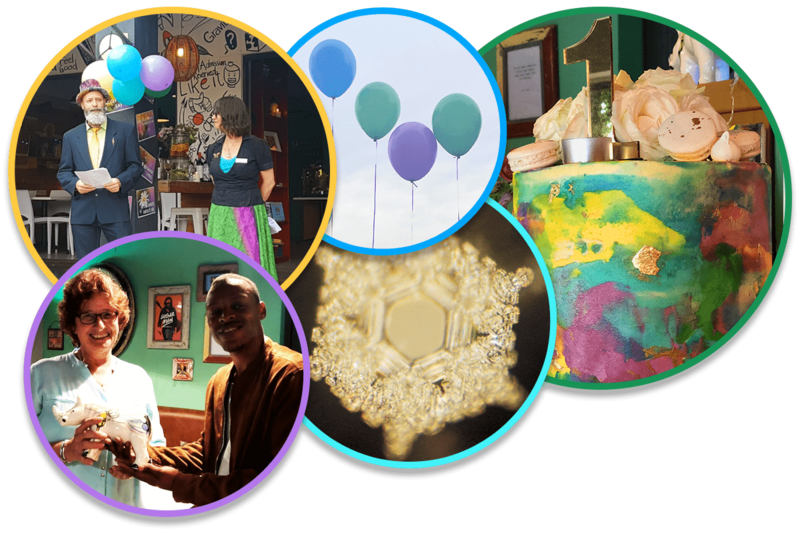 Gravity Cafe — our favorite place to meet, eat and celebrate — supplied the venue, and did the catering. Balloons bobbed and bounced off the ceiling over an enormous sugar sensation of a cake. What’s a birthday party without balloons and cake? 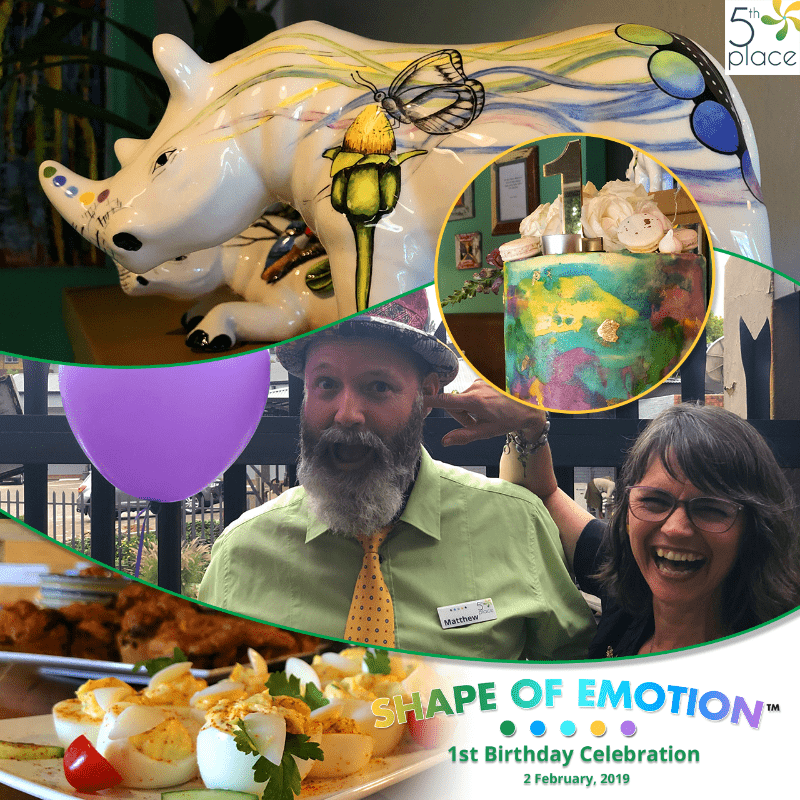 Both were guarded by the most beautiful ceramic Shape of Emotion rhinoceros. “Strong” named by her winner, Elaine Mouton, was being raffled off to raise money for a worthy Shape of Emotion Foundation course participant. 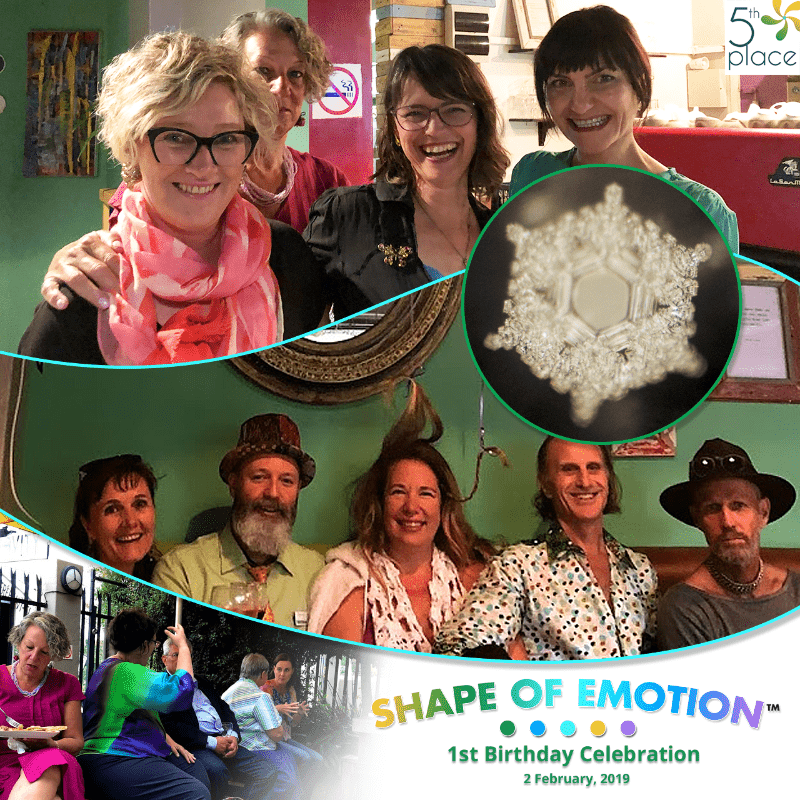 It was a night of connectedness, community, laughter, bubbles and love. We do hope to see you there next year. Watch out for us - we are coming to you in leaps and bounds.